Our famous Pancake Breakfast now until March 25 8am to 1pm! Adults $9.95, kids $6.95, under 3 are free. We'll see you there!!!! Over 17 variations of apples and 4,000 fruit trees on site! 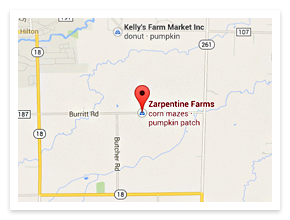 Zarpentine Farms bakes its products fresh daily. Stop in for the latest fresh specials! Our maze is now closed for the year. Did you do it? We hope you had a great time in it this year. Did you know that our Corn Maize was the LARGEST in New York State?! That's right! We had 23 ACRES of fun twists and turns to get lost in! This years maize was based on the popular children's game CANDYLAND. Congratulations to the TWO families that won the drawing for family passes to the Palm Island Indoor Waterpark in Batavia. Our famous Homemade Apple Cider Fry Cakes and Fritters! The LARGEST Corn Maize in New York State! When did the farm market get started? How many varieties of apples do you grow? How many fruit trees do you have on the farm? Yes! We accept VISA and MASTERCARD! As of August 1st, we are open for business! 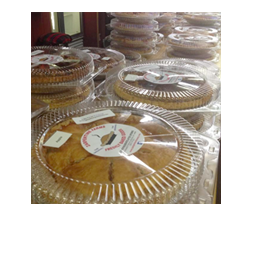 We have fresh vegetables, pies, specialty loaves, coffee cakes, cookies, fry cakes, and our wonderful FRITTERS!!! Market open at 9AM every day! Apples, Apples, Apples! Our apples will be available starting the 2nd week of August as they ripen. The orchard is looking great and we can see it's going to be an awesome year. Copyright © 2018 The Original Zarpentine Farms.